December 8, 2000 Julian Carey Dixon, politician, died. Dixon was born August 8, 1934 in Washington, D.C. He served in the United States Army from 1957 to 1960 and in 1962 earned his Bachelor of Science degree from California State University. In 1967, he earned his Bachelor of Laws degree from the Southwestern University School of Law. 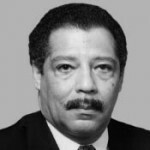 Dixon was elected to the California State Assembly in 1972 and served three terms before he was elected to the United States House of Representatives in 1978. As a freshman member of the House, Dixon won an assignment to the coveted Appropriations Committee where he remained for the rest of his House career. He also chaired the Rules Committee at the 1984 Democratic National Convention. The 7th Street/Metro Center transfer station in downtown Los Angeles is named in Dixon’s honor and in 2004 Southwestern University School of Law opened the Julian C. Dixon Courtroom and Advocacy Center.